Obituary – George, Thelma (Stewart) « Perry High School Alumni Association, Inc.
Red Hots; Glee Club; Debate; Honorary Society; Citizenship. Thelma George, passed away in 1958. 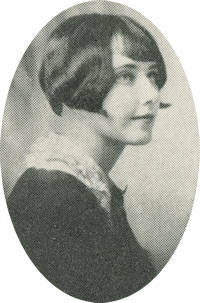 Born in 1910, she was the daughter of Dr. L. D. and Nellie Stewart. After graduating from Perry high school in 1927 she attended the Oklahoma College for Women and taught in the Perry elementary school. She and Thomas Houston “Hoot” George were married June 18, 1938, in Kay County, Oklahoma. Mrs. George is survived by her husband, of the home; daughter, Pamela; and mother, Nellie Stewart.